Let me show you a piece of great modernistic architecture and a mark for important Danish industry. 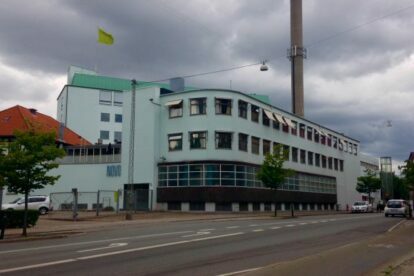 This is “Arne Jacobsen’s white factory” sitting on the border between Frederiksberg and Nørrebro. It was designed by famous architect Arne Jacobsen and built in 1935 for Novo Nordisk/Novozymes, a leading company of biotechnology and the biggest supplier of insulin. What you’re looking at is of course one of Denmark’s most important industrial keepsakes. You might know Arne Jacobsens popular ‘Ant Chair‘, of which he produced 200 originals for the cafeteria of this factory, since it was the only place that wanted it at the time… They’re still intact inside. Unfortunately, the factory isn’t open for the public, so we’ll just have to admire it from the street. The best view is definitely from Nordre Fasanvej, but you can walk around and watch the beautiful building from different angles walking in a northern direction past Hillerødgade and all the way to Glentevej. Magnificent, I tell you!